Blancpain GT Series Asia has revealed that at least three Japanese teams will return to Blancpain GT Series Asia at Suzuka and Fuji later this season after once again submitting race-by-race entries for their home rounds. D’Station Racing, Porsche Team EBI and Kizashi x Saccess Racing all contested the championship’s inaugural Japanese races in 2017 and have now committed to further outings. Additional entries will also be announced before Suzuka hosts rounds five and six of this season’s campaign on June 30/July 1. The series enjoyed a significant increase in full-season Japanese teams and drivers at the start of the year, with ARN Racing, who initially contested Suzuka and Fuji 12 months ago – and BMW Team Studie joining the GT3 and GT4 ranks, respectively. Equally, at least 10 Japanese drivers competed in both Malaysia and Thailand. 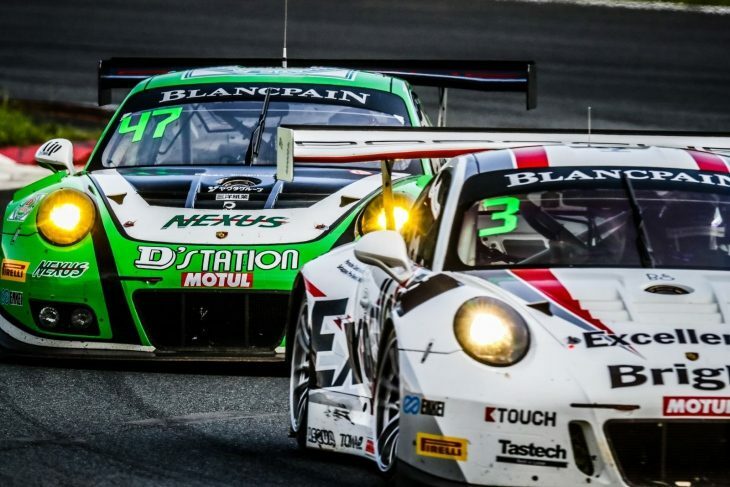 They will be further bolstered by an increased presence on home soil where Super GT and Super Taikyu squad D’Station Racing is entering the same Porsche 991 GT3 R and driver combination as last season. Indeed, team owner Satoshi Hoshino and 2004 Le Mans winner Seiji Ara also currently race together in Super Taikyu. Another Porsche scheduled to race at Suzuka and Fuji comes courtesy of Team EBI whose team principal Naoya Yamano returns to the series alongside older brother and record-breaking three-time Super GT300 champion, Tetsuya. Finally, Kizashi x Saccess Racing has confirmed that its Lamborghini Huracan GT3 will also compete at both Japanese events. The team, which is running former Ferrari Challenge driver Tamotsu Kondo and 2012 Super GT300 champion Naoki Yokomizo, currently participates in its native Car Guy Super Car Race series and FIA Formula 4 Championship. A full day’s testing kicks off Blancpain GT Series Asia’s Suzuka round on Thursday 28 June. Following Suzuka, Fuji stages rounds seven and eight of this year’s pan-Asian championship on July 21/22 before trips to Shanghai and Ningbo in China conclude 2018’s campaign.